Tom Slade sent in this one. "Ageout Stuart Shulman, drum major of the Santa Clara Vanguard, is here with one his favorite SCV alums, Melissa Slade (who marched with Santa Clara in '03). This photo was taken in the bus area after finals in Foxboro. Stuart and Melissa have remained friends throughout the years. 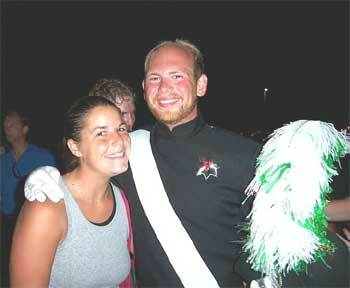 Melissa went on to march Carolina Crown in '04." Thanks Tom! E-mail your best shots from the summer to dave@dci.org along with where and when the photo was taken. Send some biographical information about yourself as well. We'll give you full credit. Also, let us know if you want your e-mail address included.